You can get involved with our ‘Brick By Brick’ appeal, which together with our other local events and activities has already raised more than £130,000 of the £170,000 we need! The St Thomas’ Community Hall is a new community resource for the people of Kilnhurst. 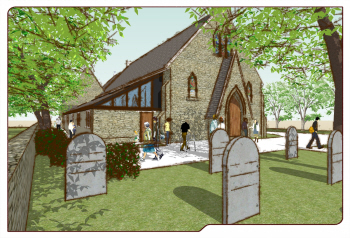 It will provide a purpose built facility from which St Thomas’ Church will deliver an enhanced and expanded offering of local community services, groups and activities. The Hall will provide a new local venue for community use and private hire at not-for-profit rates. The hall will offer a self contained meeting space adjacent to the existing church building, providing 65m2 of comfortable and flexible accommodation. It will benefit from independent ramped access, a kitchen facility and access toilets. Our overall objective is to improve community life for local people. We will do this by developing a wider package of community activities, and by encouraging others to partner with us in providing their own groups and activities. Demographic data and our own local survey suggest that community life could be much improved. The area is high on the national index of deprivation, especially in terms of employment, education and health deprivation. Although the project is a capital building project, our underlying desire is one of building community. The physical space will build capacity, enabling us to develop and grow our local provision of community groups and activities. 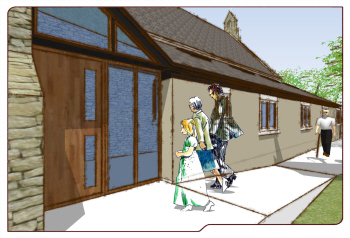 We believe that the project will succeed in building community life in Kilnhurst because St Thomas’ Church is best placed to achieve such an outcome. – experienced and trained leaders, familiar with the challenges of working with different sections of society (e.g. teenagers, children and vulnerable adults). It is our firm belief that in building this new facility, and by offering the kinds of groups and activities that we anticipate, the project will bring many lasting benefits to the wider community. We are pushing ahead with local fundraising through our ‘Brick by Brick’ appeal, with 5,000 ‘bricks’ being offered for a donation of £5 each. We are delighted that through our appeal and other local fundraising efforts we have already raised more than £130,000 towards our total. We are seeking financial help from external funders in order to meet the estimated project cost of £170,000.